Sean writes, "Why can't I get more than 99 photos on DVD from the Windows Media Center slide show? I'm using DVD-RW 4.7GB." The DVD format is limited to a maximum of 99 chapters by design. This was originally meant to subdivide a 2 hour movie into no more than 99 parts, which would mean something approaching 120 second intervals if used to the full extent. Software developers later figured out you could also use this same approach to put up to 99 still images on a DVD, one for each of the 99 chapters. Most software remains limited by the 99 chapters per movie limit. I'm currently aware of only one alternative for getting past the 99 images limit in making photo slideshows. Sonic figured out a way to extend this to 999 photos per slideshow and (to my knowledge) remains the only company offering DVD authoring software with support for more than 99 images per slideshow. 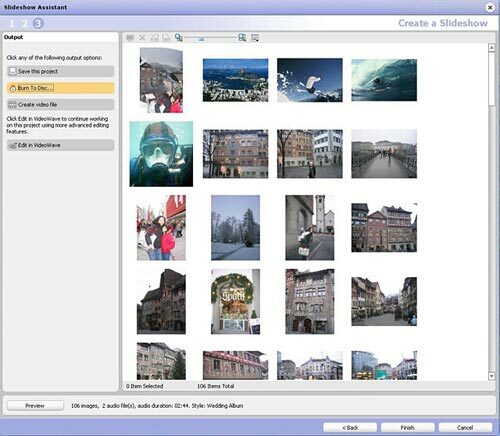 The caveat to this is the Windows Vista version of Windows Media Center now supports 999 photos as well, which I believe was licensed from Sonic. This is one of the many reasons I love the Sonic MyDVD software, which includes support for the 999 images as well as pan and zoom effects and the other motion tricks popular in making DVD slideshows. You can find MyDVD either as a stand alone application or as part of the Roxio Easy Media Creator Studio 9 package. Both versions of MyDVD create standard 4:3 slideshows as well as 16:9 slideshows optimized for HDTVs.